We are so pleased to announce that Lisa Maria-Booth, co-owner of FortCycle, will be a recipient of the NH Business Review’s Outstanding Women in Business Award at a ceremony taking place February 15, 2018. This award is presented to “women who have truly excelled, not only in their professional lives, but as leaders and role models.” Day in and day out, Lisa exemplifies these characteristics and we are excited to see her leadership recognized. 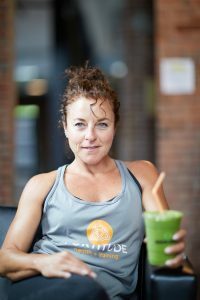 Lisa’s relentless energy and unwavering commitment to FortCycle and GreenBike Smoothies, which she co-owns with her husband David, as well as Fortitude Health + Training, which she co-owns with Danielle Perreault, have driven the customer experience for these businesses to the highest levels. Lisa and David take great pride in the spirit that exists in the FortCycle community, and the positive differences healthy living has made in the lives of our members. We have a deep commitment and passion to providing our community with fun, innovative and effective health and wellness services. Congratulations to Lisa, and let’s keep getting Fit at the Fort! Click here to read about the 2018 Outstanding Women in Business.